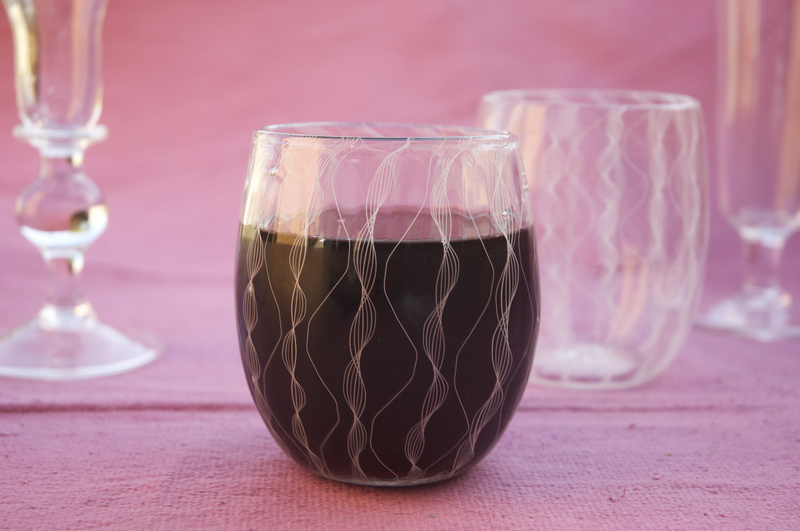 A beautiful finely made drinking glass with fine white cane work, creating these gorgeous helix patterns embedded within the glass. This process requires quite some time to prepare each cane of white glass, which then gets cut into shorter strands, heated until soft like stiff honey, stretched and twisted with other clear and white cane to create each individual helix form. These are cooled in the annealer overnight. Cut again into short strands, laid in order, a hot glass cylinder os rolled over the strands of cane, the canes stick to the hot glass, then more heating, more shaping occurs; then finally the shape of a drinking glass emerges after shaping and blowing and shaping and reheating.. This process requires finely tuned skills, patience, focus and a level of endurance, because this is not something you can put down for half an hour when you want to take a break..
Sets of 2 or more made to order.